Releasing an EP in between full length albums is a common occurrence among indie artists these days. Functionally, EPs fall into two categories: previously recorded tracks that didn’t make the cut on the preceding full-length album or tracks that preview the band moving in a slightly varied direction. 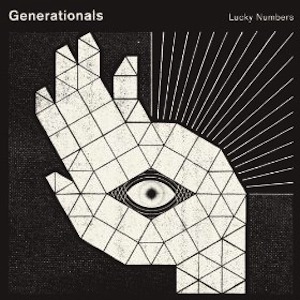 Generationals‘ forthcoming self-released EP titled Lucky Numbers shows the New Orleans duo of Ted Joyner and Grant Widmer moving into new and sonically edgier territory. The downfall of Lucky Numbers is that it’s only three tracks. But in those three tracks we see Generationals moving away from their guitar heavy sound to a lighter electro-pop aesthetic reminiscent of The The‘s early 1980s album Soul Mining. The gauzy keyboards on the first track of Lucky Numbers, “Hazel House,” mirror Joyner’s airy vocal delivery where lyrics are nonchalantly uttered rather than deliberately enunciated. The twinkling synth lines that open the title track are more rhythmic than melodic and Widmer’s monotone vocals along with the bass cut through the crispness of the synths rounding out the tonal depth of the song. Of the three tracks,”Sale City” is the most akin to songs on Actor-Caster – it’s heavier in guitars and broodier in feel, but this darker vibe is counterbalanced nicely by the call-and-echo vocals between Joyner and Widmer. Generationals’ catchy indie-pop sensibility is commercially appealing, but at the same time it remains a tad bit offbeat and edgy. If Lucky Numbers is a preview of what is to come from the band’s next full length effort, we think you’ll be pleased with the direction the boys are going.